The recent discovery of neural stem cells in the adult central nervous system has raised the possibility of repairing damaged nervous tissue by recruiting their latent, endogenous regenerative potentials (Imayoshi et al., Nature Neurosci. 2008). The development of innovative non-invasive methods to manipulate neural stem cells in the brain has been expected to contribute to regenerative medicine for central nervous system disorders. We have recently demonstrated the first successful approach for artificially manipulating the proliferation and differentiation of neural stem cells using light (Imayoshi et al., Science 2013; Imayoshi and Kageyama, Frontiers in Cellular Neuroscience 2015). We are currently extending this regenerative approach to various types of neural disease models in mice and primates, such as traumatic injury, neurodegeneration, and psychiatric disorders. 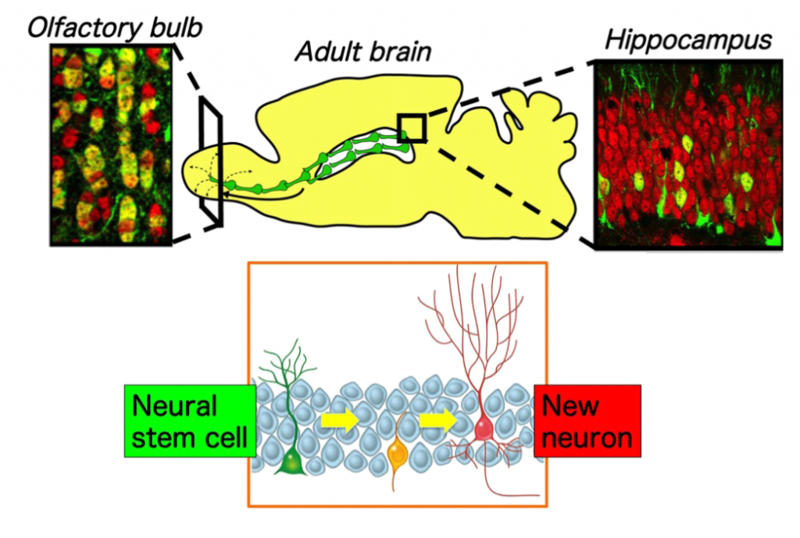 Since the initial discovery that the adult brain contains stem cells that can generate new neurons, an important question in neurobiology has arisen that concerns the functional importance of adult neurogenesis. Although a substantial body of work has shown that some of these new, adult-born neurons integrate themselves into active neural circuits, the magnitude and importance of this integration is unclear. In our previous study (Imayoshi et al., Nature Neurosci. 2008), we demonstrated that adult neurogenesis is indeed important and that it may, surprisingly, fulfill two very distinct functions. In one brain region, the olfactory bulb, adult stem cell–generated progeny play a critical role in tissue maintenance. In contrast, in a second region, the hippocampus, they serve to add new neurons that are important for adult behaviors, such as learning and memory. Figure 1. Neurogenesis in the adult brain. In the adult mammalian brain, continuous neurogenesis occurs in two restricted regions, the subventricular zone of the lateral ventricle and the hippocampal dentate gyrus. New neurons born in the subventricular zone migrate through the rostral migratory stream and are integrated into the neuronal circuits of the olfactory bulb throughout life. Our study provides clear evidence for the importance of adult neurogenesis in the normal adult brain. Adult stem cell–derived neurons are critical for maintaining the olfactory bulb, much as adult stem cell–derived progeny are essential for cell replacement in other parts of the body. When this process is perturbed, the tissue degenerates. In contrast, adult neurogenesis in the hippocampus is not required for its maintenance, but is instead required for neuronal addition and hippocampal growth, thereby potentially contributing to the ability to accumulate new memories throughout life. Our study highlighted the possibility of recruiting adult neural stem cells for neural repair, which may lead to the development of novel therapies for functional recovery after disease, trauma, or pathological aging (Imayoshi et al., Nature Neurosci. 2008; Sakamoto et al., J Neuorsci 2014). We recently uncovered the regulatory mechanisms that determine neural stem cell fate choices (Imayoshi et al., Science 2013; Imayoshi and Kageyama Neuron 2014). We showed that neural stem cell differentiation is associated with the sustained, dominant expression of particular transcription factors, whereas the proliferation of neural stem cells is associated with oscillating patterns of expression of several factors. Fate choices in neural stem cells involve various transcription factors, including achaete-scute homologue 1 (ASCL1), HES1, and oligo-dendrocyte transcription factor 2 (OLIG2). ASCL1 expression can promote the differentiation of neural stem cells into neurons, whereas HES1 and OLIG2 expression can promote the formation of astrocytes and oligodendrocytes, respectively. However, these transcription factors may also have roles in neural stem cell maintenance or proliferation, functions that seem to oppose their roles in fate determination. Figure 2. Expression dynamics of basic helix-loop-helix (bHLH) factors in neural stem cells and differentiating cells. 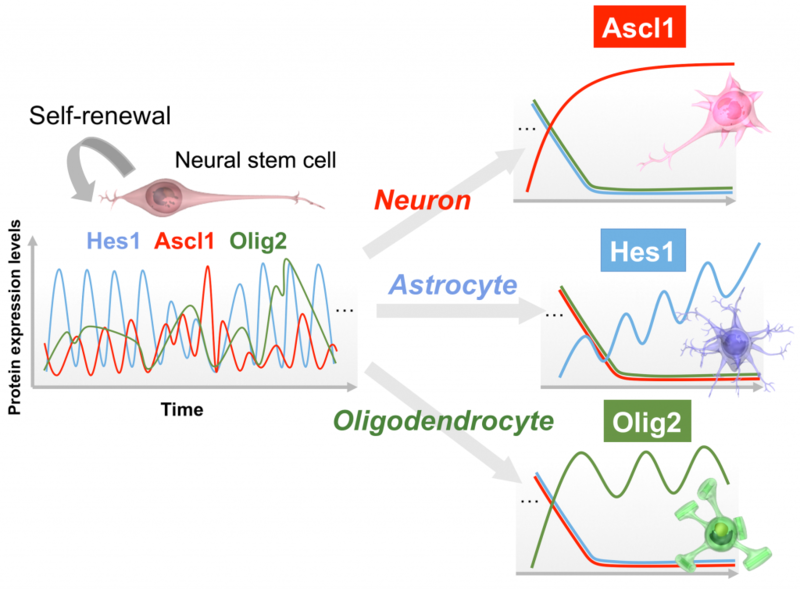 In multipotent neural stem cells, the levels of Hes1 and Ascl1 oscillate within periods of 2–3 hours, whereas that of Olig2 oscillates within a period of 5–8 hours. By contrast, during cell fate choice, one of the bHLH factors is expressed in a sustained manner, whereas the others are repressed. bHLH factors seem to exhibit opposing functions, neural stem cell proliferation versus cell differentiation, depending on their oscillatory versus sustained expression dynamics (Adapted from Imayoshi & Kageyama Neuron 82: 9-23 2014). To resolve these apparent contradictions, we developed a live-imaging system in which reporter expression was linked to expression of either ASCL1, HES1, or OLIG2. Time-lapse imaging of reporter expression revealed that the expression levels of each of these transcription factors oscillate. The periods of oscillation of ASCL1 and HES1 expression were similar (~175 min and ~150 min, respectively), but OLIG2 expression showed a much longer period (~375 min). We also found that transcription factor expression patterns change dramatically during cell fate choice. In neural stem cells that differentiated into neurons, ASCL1 expression was sustained for 6 to 8 h. Similar changes in the pattern of transcription factor expression could also be seen during astrocyte and oligodendrocyte differentiation, in which HES1 and OLIG2, respectively, became the dominant transcription factors that were expressed. Thus, key transcriptional factors are expressed in an oscillatory manner in neural stem cells, but as cell fate choice becomes established, one factor accumulates while the other two die away. 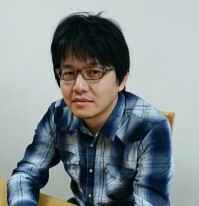 Although oscillatory expression of multiple fate determining factors underlies the multipotent state of neural stem cells, this oscillatory pattern gives way to stable and dominant expression of one factor during cellular differentiation (Imayoshi et al., Science 2013; Imayoshi and Kageyama Neuron 2014). To demonstrate the functional importance of either oscillatory or sustained expression patterns, we adopted an optogenetic gene expression system using the Neurospora crassa photoreceptor Vivid (VVD). Using this system, we created oscillating and sustained expression of ASCL1 in cultured neural stem cells (Imayoshi et al., Science 2013). Repeated exposure of blue light with 3 h intervals generated oscillatory expression with a 3 h period, whereas repeated exposure with 30 min intervals generated sustained expression. Oscillatory expression of ASCL1 promoted cell proliferation and expanded the neural stem cell pool. Conversely, sustained light-induced expression of ASCL1 increased neuronal differentiation. (A) hGAVPO activates gene expression by blue light illumination. (B) The hGAVPO system shows that oscillatory expression of Ascl1 activates the proliferation of neural stem cells, whereas sustained expression of Ascl1 promotes neuronal differentiation (Adapted from Imayoshi & Kageyama Neuron 82: 9-23 2014). Together, these data suggest that expression patterns, rather than just expression levels of various transcription factors, determine whether neural stem cells proliferate or differentiate (Imayoshi et al., Science 2013). Our study demonstrated that the light-switchable gene expression system offers a new way to control the proliferation and differentiation of stem cells by changing light exposure patterns rather than using different growth factors or chemicals, showing its applicability to regenerative medicine. I am deeply honored to receive this award. I am very grateful for the support of my mentors, members of my research team, and my family.